i wish i could say that i’ve been incredibly productive and will take this oportunity to show you all of my new fo’s. but i can’t. i’ve not finished the second log cabin sock, i’ve ripped the heather coloured slipover (which by the way now goes under the name gosford park), and i’ve stalled on the hemingway. 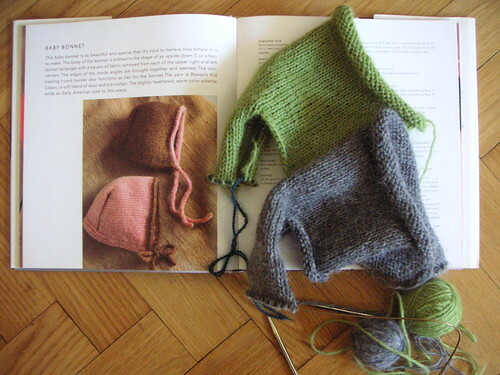 however, my friends’ newborn baby inspired me knit something for a baby for the first time, so i’ve begun two new projects, which essentially are same project, namely baby bonnet from last minute knitted gifts.